Babies can see colours at birth though often they will have trouble distinguishing similar tones. For this reason many babies prefer to look at black and white patterns or objects with similarly highly contrasting motifs. The ability to distinguish colours develops rapidly, and as early as four months old some babies begin to show a preference for certain colours. However, some babies may be born with degrees of colour blindness that probably will not be tested or diagnosed for several years. When infants are born, their visual acuity is so poor that is akin to being able to read only the largest letter on an adult’s vision test. While they are able to see a limited amount clearly, most of the world remains a blur. However, infants are able to distinguish contrasts and for this reason often show a preference for black and white patterns on their clothes, mobiles and more. These patterns could also be between other similarly contrasting colours, as it is the stark difference between dark and light that is initially attractive to babies. 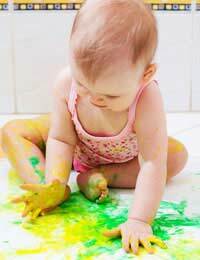 In the early months a baby’s brain works hard to learn and distinguish colours. Researchers have recently discovered that by as early as four months of age babies have not only learned to distinguish these colours, but develop a particular preference for a certain colour as well. Which colour, or spectrum of colours, is preferred will likely be unique to the baby and many babies show delight in a wide range of colours. However, even if parents notice a baby’s particular fondness for a colour, researchers still suspect that it is best to expose the baby to a wide variety of colours and patterns to further their development. Colour blindness is usually an inherited condition in which individuals are unable to distinguish colours. While it is widely believed that colour blind individuals are unable to view any colours this is true of only a very few and more often colour blind individuals see only a limited number of shades. For example, red/green colour blindness allows individuals to see all hues except red and green while blue colour blindness allows individuals to see all colours except blue and yellow. Often the colours that can not be viewed are instead perceived as black, white or grey. Colour blindness can easily be diagnosed with simple sight tests, though children are not often diagnosed until after they have learned all of the colours, can verbalise the colours and count (as required by some diagnostic tests). This means that most colour blindness is not diagnosed until the age of four years old or older. In the past it was thought that babies were born colour blind and only developed the ability to view colours as they developed. Recent studies have proven this incorrect and it is now widely accepted that infants can distinguish colours and patterns at birth, and continue to hone this skill for many months. Some babies, however, may truly have been born with an inability to view certain colours but this resulting colour blindness is often not diagnosed for several years. Parents of infants should strive to provide their children with a variety of coloured objects and allow the children themselves to select which they prefer to view.